Twenty years ago, Margarita Tsangarakis and her family bought a run-down school and converted it into what has rightfully become a 'lakefront establishment' in Hamilton - Baranaga's on the Beach at 380 Van Wagner's Beach Road, near Confederation Park. Last weekend I went, incognito, with a friend to assess the state of this aging 'grand dame'. It easily based the initial sniff test: sections were freshly painted, the floor had been meticulously swept by a gray-haired family member, clean bathrooms were fully stocked with paper towels and toilet paper, and the tables and chairs were freshly wiped down. All was clean and presentable at midday on May 11th, 2013. One might think that with an indoor seating capacity for 150, and an outdoor capacity for more than that, that a place this large might have a bit of a over-extended 'commercial' junky vib. But, to its credit, it does not. It felt 'open' and welcoming. The young serving staff were attentive and pleasant. Our teenage waitress, who was on her first day, somewhat touchingly 'blushed' when she admitted she didn't know, yet, what was on-tap. - Ah, we all remember well those teenage years at our first job. We braved the overcast cool spring day to try out the patio. Plus, we had brought the dog - a Great Dane. (Huh? A Great Dane in a restaurant? - I know, don't ask, long story...) Anyway, when we arrived we were told that there was a 'doggie section' on the patio, but since there was no one else out there at that time, we were allowed to sit wherever we wanted. That was very gracious of the restaurant. We seated ourselves front and centre on the second level of the patio. The dog quickly and quietly settled down. 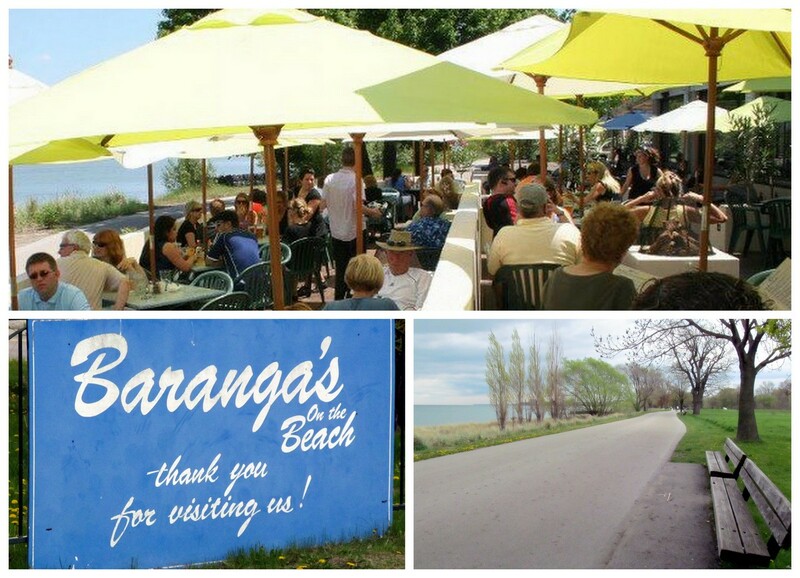 Baranga's on the Beach with impressive lake views - from the patio or the adjacent Hamilton Trail boardwalk. The menu is admittedly pricey on some items, but we concluded that lake view was the irreplaceable 'add on'. I can think of no other waterfront establishment from Port Hope to Niagara Falls that offers quite the same 'open-to-the-elements' large patio ambience. With expansive vistas, and situated directly on the Hamilton Trail boardwalk, Baranga's on the Beach manages to combine a formal, yet informal, funky euro-dining experience, (shirts and shoes required), that tantalizes with other festive attractions that most certainly ensure a 'return visit'. We were told, as example, that the previous night, Friday night, was 'Salsa Night' and that the outdoor taverna Sand Bar was packed. I don't doubt it. It felt like we were being initiated to a well-known - yet oddly well-kept 'secret' - a Hamilton Beach phenomenon. The high-walled open-air 'disco' section of Barangas has been tacked onto the south end of the restaurant, (with the two outdoor volley ball courts tacked on to that...) This open-air nightclub did remind me of a few Spanish, Greek and Italian places that I have visited over the years in Europe. For sure, it's not like any 'Canadian bar' that I know of on the Great Lakes. The open-air nightclub is accessible from the beach, has a handy bike rack at the boardwalk entrance, and offers clean bathrooms below the restaurant. The elevated mechanized fire-pit pods in the patio section added additional sizzle, though they weren't 'turned on' when we were there. I could see though how these would add more warmth, figuratively and literally. One couldn't help but get the sense that this place becomes very popular during the summer. My guess is that this place is also frequented by regulars of both sexes during the high season. Baranga's works hard at off-season events too. Weddings, Christmas, catering, and corporate functions are all offered as 'packages' on their website, where you can also review their ongoing menu. 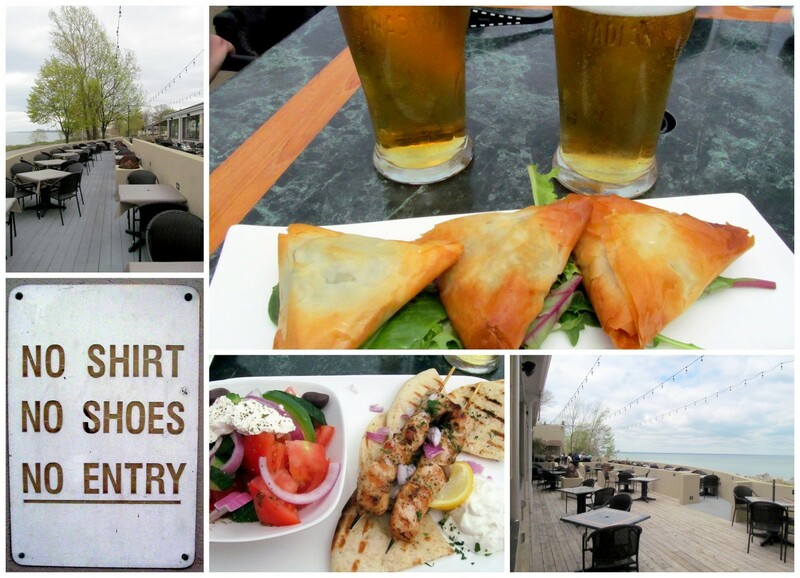 As for the food, we both had a full pint of draft (Canadian was finally chosen on-tap), split a spanokapita appetizer (3 large spinach stuffed baked phillo pastries were hot, ample and delicious), and we both had the chicken souvlaki with 'original' Greek side salad. ($2 extra). The chicken was marinated and grilled perfectly, arrived hot to the table on fresh warm pita bread with a side dish of 'house' tzatziki. The salad (onions, tomatoes, cucumbers and black olives with crumbling feta cheese on top) was a tad larger than both of us could manage, but, when doused in fresh olive oil with a splash of vinegar - no complaints. We skipped dessert and had a strong cup of coffee. If anything, that was the one area where we were a bit disappointed. The coffee choices seemed rather limited. Still, it is a restaurant and not a coffee shop. Total bill: $84 ($42 per head) inc tax with a 15% tip to the 'new girl'. 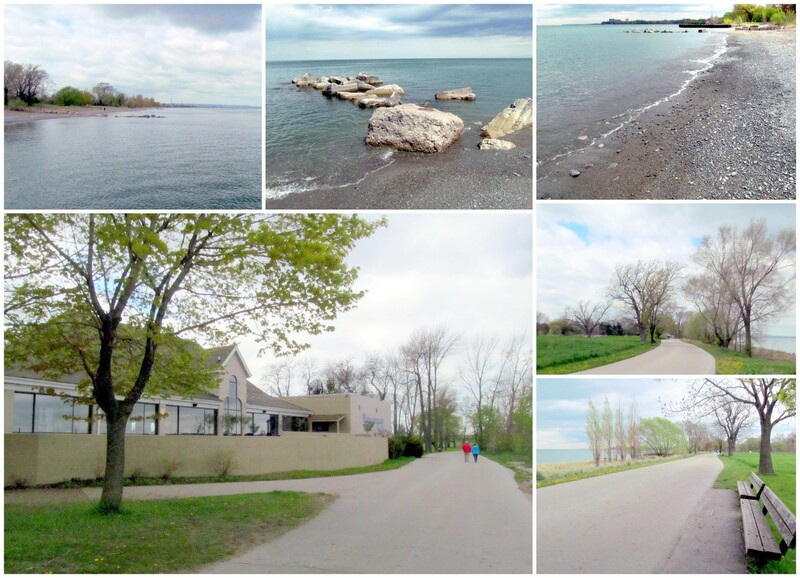 We thought that a fair price for the unparalleled lake side views. Ample good food in a euro-style patio setting requests a certain dress code. There is ample free parking across from the restaurant's front door, or free parking is also available just down the road in the public parkland beach area. It's a nice short walk along the boardwalk up to the restaurant. Baranga's on the Beach is accessible as well by boat: N. 43" 16.386 W079"454.40 with 6-7 foot drop anchor depth out-front. By the way, Baranga means 'hut on the beach' according to Margarita, who is Greek. But when I googled the word 'baranga', the definition came back as Portuguese slang for 'ugly woman'. No matter. There's nothing 'ugly' about this maturing 'grand dame'. If anything, this 'hut' gives the whole area a shot in the arm as a fun place to enjoy a cold glass, leisurely meal, soak in the summer sun (when it's shining) and watch the ever-changing lake. I'd say it is well worth a visit, or two, by land, lake, bike or foot. Baranga's on the Beach Facebook header photo. Ever keeping up with the times, Baranga's on the Beach has now joined Facebook. After your visit, why not 'like' their Facebook page, and then go for a second meal and/or a midnight wiggle? It's a Hamilton institution. Hours of operation: Sunday to Thursday, 11:30am - 11:00pm (12:00am Victoria Day weekend to Labour Day Weekend), Friday and Saturday 11:30am - 12:00pm (2:00am Victoria weekend to Labour Day weekend). Reservations are not necessary, but are recommended. 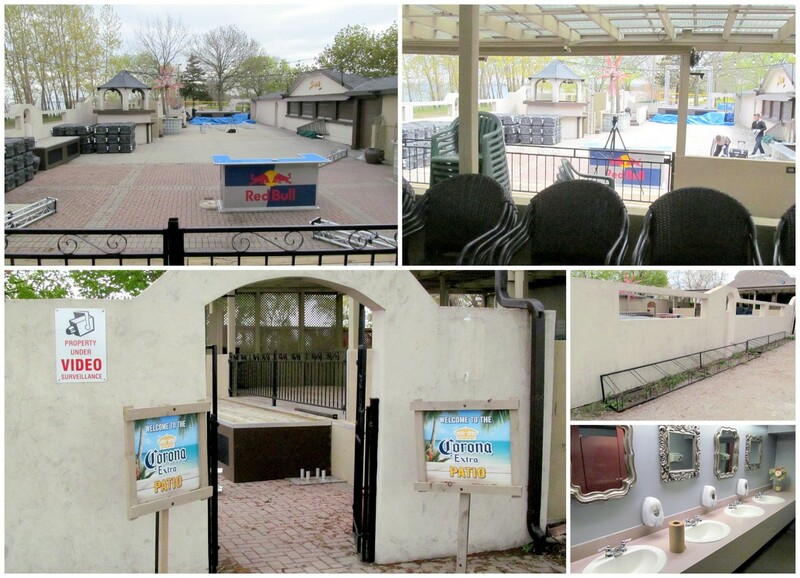 Phone 905-544-7122 or email bonthebeach@barangas.ca. The secret ingredient is stucco. would have been great to see another 4 or 5 places like this open along the beach there, stretching towards Adventure Village, but I've seen the new plans for the land and it's underwhelming as expected. I think another restaurant would be fine down there, or a cafe. But there's a risk that would come from more places with outdoor bars/patios. This is not to say Baranga's is not a great place - it is. I'd just hate to see the area become another Hess Village. And staying simpler isn't a bad thing in my opinion. Like Bayfront Park, Confederation and the Beach Strip work as they are. Van Wagners Beach School was constructed as a two-room school in 1905 on land purchased from the Gage family. The school was extensively flooded by Hurricane Hazel in 1954. It closed in 1961 and was sold to City of Hamilton Parks & Rec that year but apparently remained empty. The property was sold again in 1980 to the Hamilton Conservation Authority, then again in 1986 to the Hamilton & Region Arts Council and renovated with the intention of functioning as an arts facility, but that plan never panned out so it was sold again in 1992 to the Tsangarakis clan. Stucco there may be, but at least it didn't go the way of the Dynes. In the mid 1960s it housed the furniture and artifact collection from Dundurn Castle while Dundurn underwent a major restoration for the federal centennial celebrations. My Mom was a student at Van Wagners Beach School years ago and she grew up in the area. It was a fitting place to have her "celebration of life"... Margarita and her staff provided fantastic service to a celebration that my Mom would have been more than happy with!! Thank you so much for a wonderful afternoon. I look forward to returning to celebrate happier occasions in the future. The old school house was supposed to have been torn down as part of the clearance of van Wagner's Beach/Crescent beach 1958-63 to make way for what became Confederation Park. The area was formerly a beach neighbourhood. One of the project funders was the federal government whom wanted the school house demolished as part of the funding agreement. Reg Wheeler bamboozelled them into believing the the school house had indeed been torn down - not so of course. 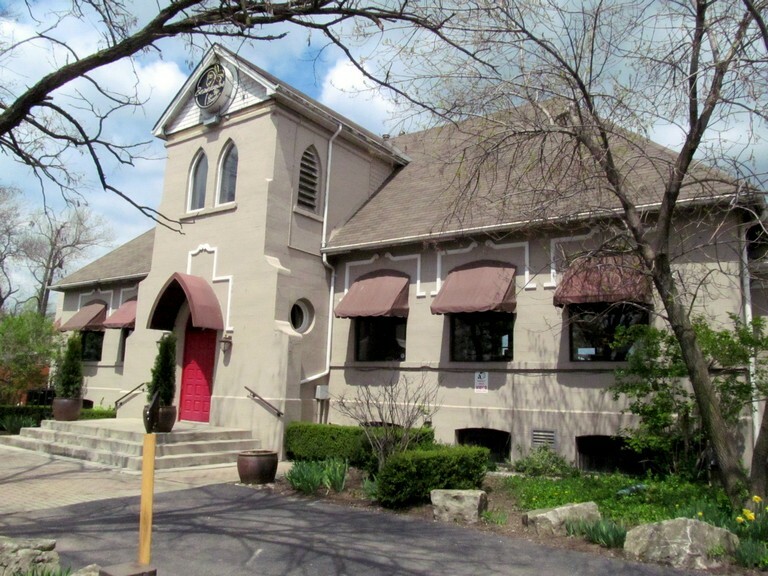 That building has served as a Christian centre and also as a day care facility. (Fick, R. The Zero Option - Urban Renewal and the Clearance of the van Wagner's Beach Community, Hamilton Ontario, 1958-63. Available at Special Collections, Hamilton Public Library). I am very grateful for the incoming comments on this thread that have outlined the fascinating history of this unique place. Thanks! I was a student at this school from 1940 to 1948. We always had the luxury of eating our lunches on the beach in good weather.We used to watch guns being test fired out into the lake during WW11.With the ponds across the road and the lake behind we had a great lot of nature studies as well as freedom during lunch hours.The building is the last remaining building is the last original building on the beach.A lot of homes disappeared after hurricane Hazel.